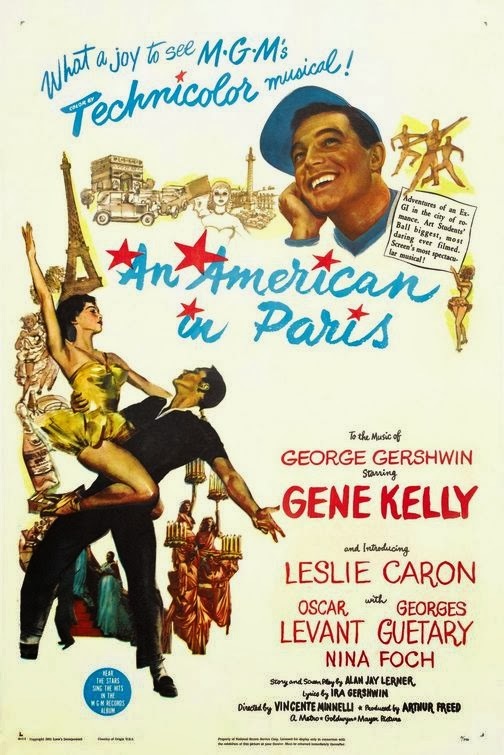 To say that Vincent Minelli's AN AMERICAN IN PARIS is likely the best of the canonical MGM musicals from the legendary Arthur Freed Unit (though many give that honor instead to SINGIN' IN THE RAIN) is pretty much saying it's one of the best-ever productions to ever come out of Hollywood. Period. Yes, even better than whatever Adam Sandler's latest is. And come out of Hollywood it did; aside from a few location shots, this was predominantly done on the Los Angeles backlot of the old MGM studios, long since vanished, and with masterful filmmaking with class and pop-sophistication, also now largely extinct. Jerry Mulligan (Gene Kelly) is an ex US-serviceman who decided to stay in Paris after VE Day and try to establish himself in the Bohemian lifestyle of a painter (living in a wonderfully cramped apartment with a pull-down hammock). He meets brash young Lise (Leslie Caron), a dancer working as a rude salesgirl (it's Paris, after all), and their initial hostility turns to infatuation. But there are complications. Lise, a war orphan, is engaged to her father-figure, one of Jerry's French pals, entertainer Henri (Georges Guetary). Jerry has caught the eye of wealthy American socialite Milo (Nina Foch), who becomes his patron and enables him to mount his own debut gallery show. But Milo wants to possess Jerry romantically, as well. Can Jerry and Lise find love together? The unpromising plotline is rather telling in its values. Feminists can get in a PMS-rage that newcomer Leslie Caron looks young enough to be Jerry's daughter (or Henri's granddaughter), whilst the major crime for villainess Milo - besides trying to acquire the hero like so much sculpture - is being a woman visibly over 30 and successful. But dialogue (by Alan Jay Lerner, whose script won one of the picture's seven, count 'em, 1951 Oscars) is consistently pointed and witty. It especially suits the real scene-stealer of AMERICAN IN PARIS, a guy not well remembered these days - Oscar Levant (proud subject of one of the most hideous Richard Avedon celebrity portraits ever snapped, Google it). A famously neurotic piano-player, radio personality and author, Levant plays Jerry's odd-couple best American pal in Paris, a would-be pianist ("the world's oldest child prodigy") basically idling away his time and talent and making delicious sarcastic remarks as he observes the various love triangles. Even without the music this would have been a fun romantic comedy to watch, but the Gershwin-inspired score is awesome, integrating the musical numbers into the narrative with consistent invention. Of course, the famous finale is a 17-minute climactic dance-ballet in which Gene Kelly and Leslie Caron dance through scene after scene, with design, costumes, Technicolor color pallet and lighting inspired by various French Impressionist masterpieces. Film just doesn't get any better. But just to depress you, let me recount an anecdote I read in a book I owned back in the 1970s, 'The World of Entertainment', a sort of 'Easy Riders and Raging Bulls' artistic and business history of the Freed Unit. 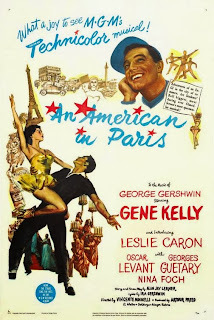 It evoked a very vivid picture for me of AN AMERICAN IN PARIS, screened by Arthur Freed and Vincent Minelli after its completion, for an elite cadre of MGM executives. The author described how a tired bunch of gray-haired guys in suits filed into the auditorium and sat subdued through the whole 113 minutes. When the lights went up, the executives were restrained in their praise. They thought it was a nice enough picture...but could Minelli cut out that long, long dance number at the end? It just didn't seem to have anything going on that advanced the story. Maybe that's just an apocryphal, cautionary tale of the wretched pit of slime that is the movie industry...but can you imagine if AN AMERICAN IN PARIS did go out at 96 minutes, with that George Gershwin finale on the cutting-room floor? What stupidity! What Philistines! What 1950s fascist-capitalist-pig values!